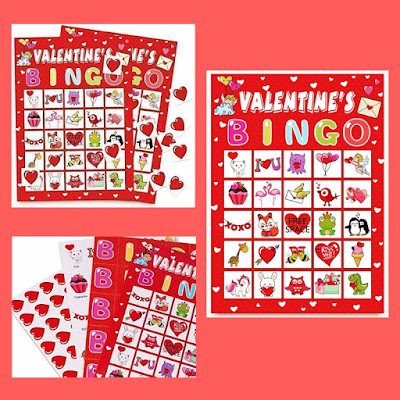 Valentine's Day Bingo Game Cards for Kids Class Party - Just $10.95 + FREE Shipping w/Prime! Check out this Valentine's Day Bingo Game Cards for Kids Class Party on Amazon for Just $10.95 + FREE Shipping w/Prime! Package includes 24 unique Valentine's Day bingo player cards , 18 caller chips,2 calling cards.The bingo game instruction is printed on the box. Each bingo game player card size: 5 " x 7 " .Caller chip measures 3.5” x 5”.Easily cut along perforated strips of chip sheets. The cute design and fun playing options make these bingo game cards a must-have for any Valentine's Day themed party. Use as a classroom game, party game or family home activity.Buy a bunch of little prizes for little ones and they will love winning the little prizes. Will be the big hit at your Valentine’s Day party.Perfect for both children and adults of all ages!